In a recent decision by a New York Supreme Court judge, the court described the limits of school liability for accidents occurring off school property, after a child has recently disembarked from a school bus. The court dismissed the claims against the school, nevertheless allowing claims against a bus driver and his employer to progress toward trial. Elijah is the 12-year-old plaintiff at the center of the case referenced above, Archer v. All American School Bus Corp. et al. At the time of the accident, Elijah lived in a shelter with his mother. His mother had previously signed a permission slip which authorized Ivan Prince, Elijah’s school bus driver, to stop the bus and drop Elijah off a half block away from the shelter, so that the other children on the bus wouldn’t see Elijah enter the shelter. On the day that Elijah was injured, he had been misbehaving on the bus, and the bus matron, Charlotte Harps, wished to speak with Elijah’s mother about his behavior. Prince dropped Elijah and Harps off about a half block away from the shelter, as usual. While initially holding Harps’ hand, Elijah immediately ran off in the opposite direction of the shelter, while Harps continued toward the shelter. Elijah then remembered that he had left his scarf behind, and re-entered the bus to retrieve it. Elijah exited the bus again. Prince pulled the bus forward to vacate a fire lane, then turned off the engine, locked the bus doors, and left the driver’s seat so that he could watch over the other children in Harps’ absence. Elijah told the court that he then remembered another item he’d left behind, and attempted to re-board the bus, but found the doors locked. Elijah said that Prince instead indicated that he should come around the front of the bus to the driver’s side door—the door facing street traffic. Elijah came around to the driver’s side, and was then hit by an oncoming car. Prince testified that he did not see Elijah re-enter the bus, nor did he waive Elijah over. Harps finished at the shelter, began walking toward the bus, and noticed Elijah being attended to by two adults. She boarded the bus, which left. Both Prince and Harps testified that they did not learn of the accident until they reached the bus depot after the completion of their run. 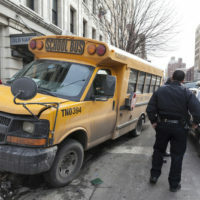 Elijah’s mother filed a claim for her son’s injuries on his behalf against: Prince and his employer, All American School Bus Corp.; Harps and her employer, Rainbow Transit, Inc.; the City of New York; the New York City Department of Education; and the Board of Education of the City of New York. These defendants all moved to dismiss Elijah’s claims, arguing that, even if Elijah’s testimony were true and accurate, they did not have a duty to protect him from the injuries he experienced. The court largely agreed, dismissing all but the claims against Prince and All American School Bus Corp. The court noted that schools do have a duty to supervise the children in their care, but that they are not expected to continue those supervisory responsibilities once the children are no longer in their physical care. “Schools are under a duty to adequately supervise the students in their charge and they will be held liable for foreseeable injuries proximately related to the absence of adequate supervision. However, a school’s duty to protect its students from negligence is coextensive with and concomitant to its physical custody and control over its students.” To say it another way, while schools must try to imagine and prevent the sort of harm that could come to a child while on school property or the school bus itself, the school does not have to continue supervising the child once he has left the school’s physical control. The court described Harps’ responsibility toward the child similarly, noting that, since Harps was told that the child’s mother permitted him to walk home alone, she did not need to continue looking after him while he was on the sidewalk. The court described Prince’s duties toward the child as being those of a common carrier—i.e., the same duties that any bus driver would have to keep their passengers safe from harm while entering, exiting, or riding in their vehicle. The court determined that it would need to be resolved by a jury whether Elijah’s or Prince’s telling of events was more accurate, and that, if Elijah were trying to board the bus but was directed by the driver to walk into moving traffic to do so, Prince and All American School Bus could be responsible for Elijah’s injuries incurred when trying to get back on the bus. If you or your loved one has been injured in an accident while on a school bus, city bus, or other public transportation, contact compassionate, dedicated Hudson Valley personal injury law firm Rusk, Wadlin, Heppner & Martuscello for a consultation on your potential lawsuit for money damages, at 845-236-4411 (Marlboro), or 845-331-4100 (Kingston).